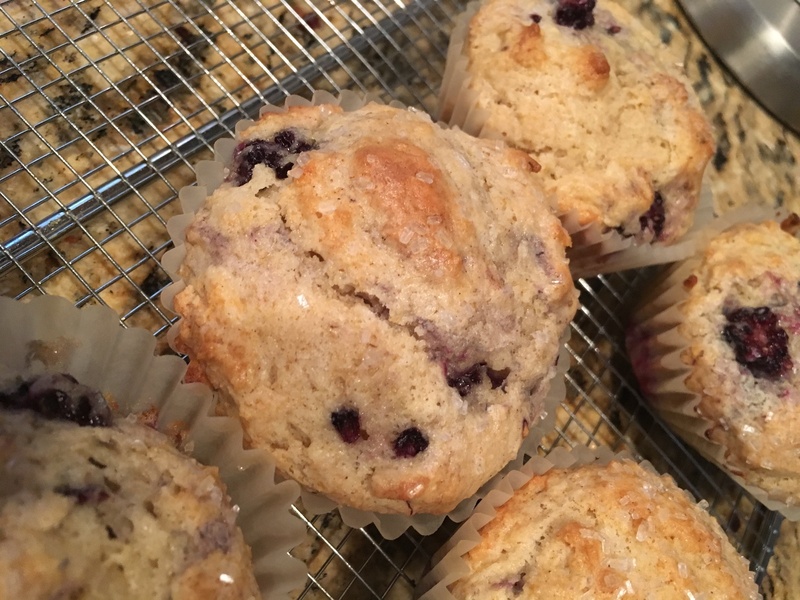 This is a keeper of a Blackberry Muffins Recipe for sure! We are at the time of year around here where fruit is stupidly expensive. $1.99 a lb for apples is higher than I’ve ever seen it. Hopefully spring brings with it some new crops that bring our prices down. Berries must be in season because they’ve been fairly reasonably priced, with blackberries at $.99 a 1/2 pt at City Market – and I got some for $.99 a pint at Sprouts the other day as well. Berries keep for a good long time in the fridge if you rinse them well, and get them OUT of that stupid plastic container and diaper thing they come in – that diaper thing causes rot faster than anything. 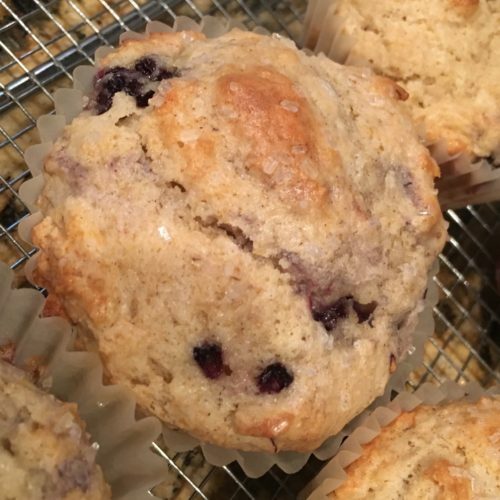 I put mine in a sealed container with a few paper towels in the bottom, that way they’re ready to go when you want to make this blackberry muffins recipe! I’ve had blackberries and blueberries keep for 2-3 weeks in the fridge like this. Raspberries are a bit more delicate, though – they don’t keep as long – but they should be stored the same way. So needless to say, I had a lot of blackberries on hand and while we eat them happily – I wanted to make something for the boys to take with lunch es and have for breakfasts this week. I’m on a low-fat diet so I adapted this recipe just a bit from one I found at SimplyRecipes.com. Hope you like it! These are pretty amazing! Sweet, easy, big and fluffy! Give them a try! 1 1/2 C Fresh Blackberries cut in half. If you use frozen, stir them in mostly frozen so they don't turn to mush in your batter. Line a Giant Muffin Tin with regular size liners, then spray each cup as well. Trust me -this makes really nice muffins and they crawl up the sides a bit - making them fluffier. In a medium bowl, combine dry ingredients, flour, baking powder, baking soda, cinnamon and salt with a whisk to incorporate air. In a large bowl, whisk together eggs, sour cream, milk, sugar, butter and vanilla. Fill muffin cup liners all the way - if you're not using liners - fill the cups up 2/3 to 3/4 in a jumbo tin, nearly full in a standard size muffin tin. Bake for 19 minutes - check with a toothpick. Remove and let cool for a few minutes then move to a wire rack to cool completely.